Universal Converting Equipment is a supplier slitter rewinders and converting machinery to the converting industry worldwide. Over 600 installations around the world over the last 20 years. 1996 – Universal Control Equipment formed to supply drive and control systems to the converting industry. 2002 – Universal Converting Equipment trading name adopted following the expansion into machine manufacturing. 2003 – Universal Adhesive Systems Ltd formed and acquired the assets and key personnel of Mercer Adhesive Systems limited. Purchased building and located new business in Daventry, UK. 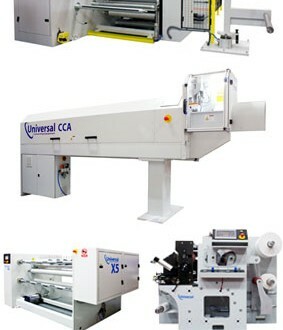 2003 – Universal Converting Equipment purchased larger premises in Ipswich, UK to allow expansion of slitter rewinder production. 2011 – 500th installation worldwide. 2012 – Purchased neighboring buildings in Ipswich, UK to increase manufacturing space by 50% and increase manufacturing capacity by 100%. 2014/15 – Installed a range of CNC controlled machine tools for manufacture of mechanical components. 2015 – Awarded Regional Growth Fund grant to further expand the CNC machining capability. Universal Converting Equipment design, develop and build slitter rewinders, salvage rewinders, core cutters, hot melt adhesive coating and laminating systems and ancillary systems. The Universal range of Slitter Rewinders has the small footprint low cost ‘X1’ at one end of the scale and the highly automated ‘X6’ at the other. We develop and build both the machinery and control systems so we offer a high level of customisation and prompt support. All machines are designed and built in the UK. Universal offer a wide range of ancillary equipment, including automatic core cutters, drive and control system upgrades, web guiding systems and differential winding shafts. Universal also produce a range of hot melt adhesive coating and laminating equipment.